Say hello to today’s featured diver, Lynn Funkhouser from Chicago. Lynn has been diving since 1967 and it certainly seem like the passion still burns! 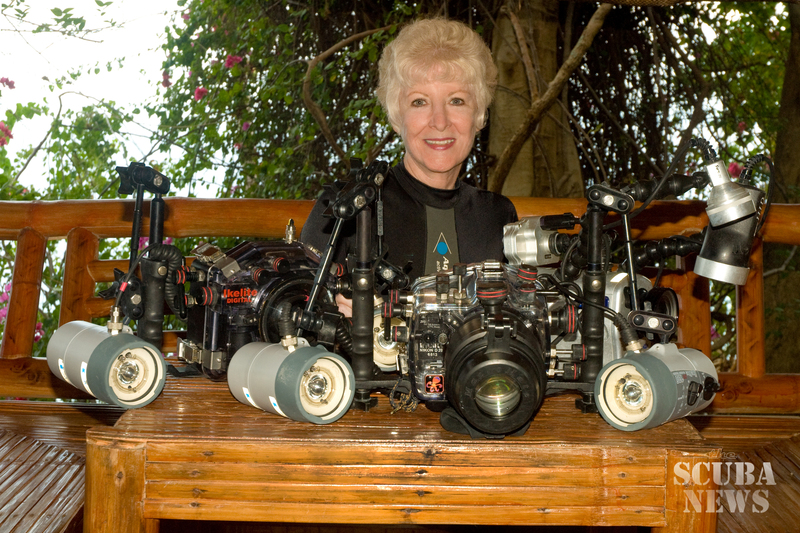 In addition to being a highly qualified diver, Lynn was also accepted into the Women Divers Hall of Fame in 2000 and became Diver of the Year in Arts at Beneath The Sea in 2014. I started diving in 1967 in Bimini & I was instantly addicted. Why did you start diving? Friends took me diving & I then scheduled my life around diving as much as possible & traveling the world. What made you choose to become a dive professional? Which is your favourite dive site and why? The Philippines is my very favorite. I started diving there in 1975 & it became my “gold standard”. I have dived there 2 -3 months per year, every year, & have dived 260 islands. It has the greatest species diversification & always still see something new on every dive. Also the people are the best & food is great! What has been the most memorable dive of your life and why? So many! Recently photographed the Oceanic Thresher Sharks at Malapascua & fell in love with their grace. They come up to 90′ every day to be cleaned. No cages. If you would come back as a marine life form in your next life, what would that be? A dolphin, but nowhere near Japan!!! Who is your dream dive buddy? Any great critter finder who is easy on their air is a great dive buddy! What dive locations are on your dream “bucket list” and why? More islands in the Philippines. Love it there! What is your favourite piece of diving equipment and why? My computer as it allows me to stay longer & bails me out when I have to get that last shot!!! If you were to launch a campaign to raise awareness on a specific issue that affects divers, the oceans or marine life, what issue would you target and why? I am an activist & am constantly signing petitions & raising awareness. In ’86 I lived with the blast fishers & sodium cyanide fishers & photographed them. I became one of the founders of the International Marinelife Alliance. We trained fishers to use hook & line to catch fish & to insert a needle into their bladders so the fish decompressed & lived. It could be sold as a live fish for 10 times more money so fishers needed to catch fewer fish & preserved their reefs so didn’t need to travel so far. Also trained cyanide fishers to catch aquarium fish with barrier nets & hand nets & that allowed the fish to be sold for more money & also kept the cyanide off the reefs . Presently love Sea Shepherds!!! If I was younger I would be on one of their boats!!! Where will you be in 10 years and what will you be doing? Who knows? Probably still diving in the Philippines.